Recently we sent Anthony Chiaravallo from Conscious Connection to the 7th Annual MIT Sustainability Summit, titled “Farming, Food, and the Future,” held on McDermott Court at the prestigious MIT campus in Cambridge, Massachusetts. 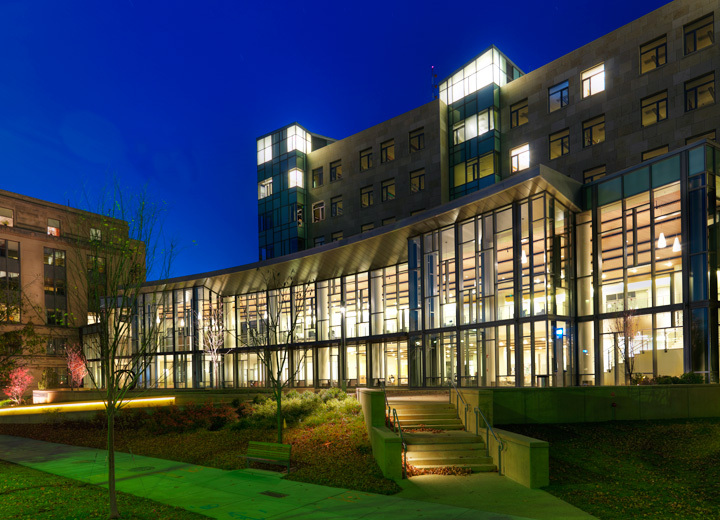 The MIT Sloan building pictured here is their most energy-efficient building on campus, equipped with numerous sustainability features, including a green roof. With exclusive access to this one-of-a-kind academic conference, our team had a chance to delve into the minds of Jason Jay, Director of the MIT Sloan Initiative for Sustainable Business, Kelliann Blazek of the Harvard Food Law and Policy Clinic and other like-minded game changers dedicated to transitioning the world to a circular economy. The conference opened up with the identification of explosive population growth as the main challenge and opportunity for sustainable global food production. The United Nations Food and Agriculture Organization estimated that 805 million people suffered from chronic undernourishment during 2012-2014. Moreover, some 61 countries had protests or riots over food shortages last year. Couple those statistics with the fact that the world’s population is expected to grow from 7.3 billion to 10 billion by 2050, and the task of feeding the masses becomes that much more daunting. On the opposite side of the spectrum, many of us who have access to food are plagued with obesity. According to WebMD, the proportion of obese people has grown steadily for the last few decades. Currently 31% of adults are obese and 15% of children and teenagers age 6-19 are overweight. This level of obesity constitutes a severe public health crisis due to diseases associated with obesity, including heart disease, cancer, and diabetes. Our current food system produces lots of cheap calories, processed foods, and artificial ingredients, and this fact needs to be changed. Along with these issues, the world needs to revise current farming methods to address sustainability crises. According to DoSomething.org, the world’s current industrial approach to food production has resulted in erosion, deforestation, depletion and contamination of soil and water resources, reduction of biodiversity, and abuse of labor. New approaches must be implemented that assure the health of our environment while providing for economic profitability as well as social and economic equity. Historically, the world has functioned within the framework of traditional linear economies in which resources are made, used, and then discarded. As we become increasingly aware of the limited supply of natural resources the world has to offer, the concept of a circular economy has developed. Simply stated, a circular economy ensures that maximum value is extracted from products while they are in use, and then recovers and regenerates products and materials for future use. Critical elements of a successful circular economy include infinite recycling of materials, use of energy derived only from renewable/sustainable sources, and maintenance of global ecosystems. Another term used to describe the circular economy is “cradle-to-cradle” or C2C. According to the book Cradle to Cradle, the current industrial model is a cradle-to-grave approach in which as much as ninety percent of the materials used end up as waste, much of which is toxic. Conversely, the cradle-to-cradle approach calls for products to be designed so that, after their useful life, they provide nourishment for something new—either as “biological nutrients” that safely re-enter the environment or as “technical nutrients” that circulate within closed-loop industrial cycles without being “downcycled” into low-grade uses. Malaika Thorne, founder and CEO of Terracentric Press, who has helped reduce waste in major cities, developed offshore wind power plants, and teamed with entrepreneurs to create products from municipal waste. Tim Greiner, Co-founder and managing director of Pure Strategies, who has worked with retailers such as Annie’s, Walmart, and The North Face in their sustainability undertakings. Ana Rios, Climate Change Specialist at the Inter-American Development Bank, who has been interviewed by CNN and the New York Times regarding her expertise. The Role of Retail in the Circular Economy. Featuring panelists from Whole Foods, Stonyfield and the Environmental Defense Fund. Notable MIT and other college researchers, specialists in farming industries and aquaculture, retail company representatives (Whole Foods, Stonyfield, Anheuser-Busch) and a myriad of other exceptionally-credentialed speakers shed light on the changes that have taken place in the world to date as well as directions to be taken in order to forge a sustainable future. Regardless, the world has a long road ahead to even remotely begin to resemble the ideal circular economy. Two of the largest factors that can accelerate this process are consumer demand as well as the support of big brand corporations. According to Karen Franczyk, Green Mission coordinator for the North Atlantic region of Whole Foods, when consumers care about the impact of where their food comes from, producers are forced to respond. In fact, consumer demand on sustainable sourcing has already started to have an impact, driving big brands to influence change by creating sustainable partnerships with their suppliers. However, in order for consumer demand to really kick into gear, consumers must become increasingly aware of the problems faced by the world around us. For instance, it would be hard to exist in America without being aware of the topic of climate change. But how many coffee addicts realize “coffee is the canary in the coal mine of climate change?” If temperatures continue to rise, coffee bean farmers will have to continually relocate to find cooler altitudes and eventually, conditions favorable for growing coffee beans will no longer exist. Tell someone their summers may be a bit warmer and they shrug; tell someone their coffee is at risk, and they will be much more likely to become involved. Retailers such as Whole Foods have taken measures to try to raise consumer awareness and encourage them in making educated decisions when choosing products. Unfortunately, in order for consumers to make the best decisions, products must provide transparency regarding product inputs and processes through the supply chain, and this information often is not readily available. Consumers as well as the retailers themselves need to advocate for future change on this front. Because consumers may be concerned about higher prices brought about by sustainable practices, it is important to raise awareness of longer-term, significantly-greater costs of not buying healthy products. For instance, while it may seem cheaper to buy non-organic products now, your lifetime costs (both physically and economically) will far outweigh the cost of buying organic if you wind up with medical bills to fight cancer due to ingested pesticides. Examining aquaculture yields a similar concern. Does it really matter if you buy farm-raised fish that are packed together in over-crowded conditions? Actually, research has shown that stress may reduce a fish’s immunocompetence and may affect reproduction by altering levels and patterns of reproductive hormones. Little is known about what long-term risks to consumers these changes in the fish may yield. Fedele Bauccio, Founder & CEO of Bon Appetit Management Company (BAMCO) spoke on the importance of making sustainabile food available to all. Turning to look at the involvement of big brands in the enhancement of sustainability, Fedele Bauccio shared the shining example that BAMCO sets in the way it conducts business. BAMCO, which provides food service to corporations, universities, and museums in 32 states, is the first food service company to commit to sustainable seafood, reduced antibiotic use in farm animals, BGH-free milk and cage-free eggs. The company also takes measures to address food’s role in climate change as well as farmworker rights. With regard to food distribution, John Lienhard, Director of the Abdul Latif Jameel World Water and Food Security Lab at MIT, noted that “Food supply is one of the defining challenges of this century.” Ann Thrupp Executive Director of the Berkeley Food Institute – U.C. Berkeley, says that we have enough food production to meet current needs, but the food produced does not always reach the people who need it, and if it does, it does not always meet their needs. Lienhard also stated that there is enough food waste to feed the world’s underfed four times over; if food waste were a country, it would be the third largest contributor to greenhouse gasses. It was posited that in order to feed the world, we don’t just need more calories and monocultures; rather, local and regional food systems need to be bolstered. Whether we are acting as consumers, employees, or business owners, it is crucial that we understand that even the little changes we make can collectively add up to be monumental. While it might be great if each of us could adopt 100% sustainable practices overnight, that simply may not be a realistic goal for many of us, and in fact, it would cause mayhem in the world’s economy. But what if we each made one change? And then, once that change was comfortably incorporated in our workplace or in our lives, what if each of us made one more change, and then another? If this continued, the end result would be a much greener world, and sustainability conferences would no longer be sustainable.